Hello all you crafty friends out there. Today, we have a challenge from 613 Avenue Create. This week's challenge is birds of a feather (birds, feathers, wings). The interpretation is left up to you. As always, you can choose to skip the challenge and enter your anything goes project as well. Our sponsors this week are Oak Pond Creations and Doodle Pantry. How awesome is that! My card is brought to you today by Doodle Pantry. I'm using the image, sentiment and designer paper from the set Critter Tales. This set is free with purchase this month and you still have today and tomorrow to get in on the deal. I love this Flamingo. I chose to use the PRE-PRINTED image on white card stock. I used Cameo Coral ink from Stampin' Up! to distress the edges. I did the same thing for the sentiment. I used Spellbinder's Labels Four dies for the image and sentiment and Gold Labels Four dies for the frames behind them. I took white feathers and inked them a little with the Cameo Coral ink and secured them to the designer paper. Using pop dots, I layered the image over the feathers and the sentimental above that at an angle. I finished the card off with some new black bling crystals from Queen & Co. that I just picked up at the Scrapbook Expo in Anaheim this weekend. What a fun time that was! Here is a picture of what you will receive in the entire set. Adorable card! Love the feathers behind the flamingo image! Thank you for sharing with us at MFP Simple Salutations Challenge. Love this shade of peachy pink and the addition of the feathers, such a fun and decorative detail! Lovely Bird-day card. Thankyou for joining with the challenge at Digi Galore. Good Luck and hope to see you again soon. Susan, love your pink flamingo birthday card is very pretty. Thanks for entering our Challenge #57 - "Animals"--pleaser come by Simply Create Too Friday to enter our new challenge too. Fun, fun, fun love the addition of the feathers! Susan I LOVE how you framed it in black and the cute feathers, very nice! 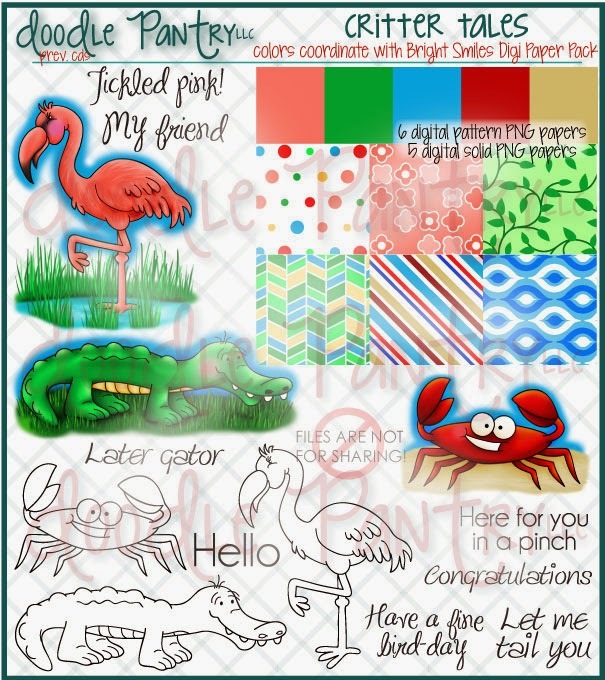 Love how you colored the flamingo and the CAS lay-out. We are so blessed with your wonderful project and hope you join us again in this week's Challenge at Word Art Wednesday. I want to share this verse with you in Luke 1:37 which says, "For no word from God will ever fail." God bless, always! Super cute creation, love the colour combo gorgeous take on the chall theme. Super cute and fun card. Love your feathers embelly! What a great card! Love the feather accent. beautiful card, love the added feathers. It doesn't get cutter than this Susan! Great card! Wonderful pink colors and fun image. Love how you put together this card using Doodle Pantry components, wonderful! Thanks so much for the lovely comment, Susan! Have a great weekend.